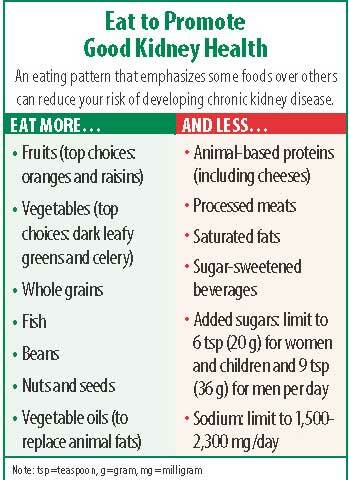 Smart diet choices can promote good kidney health and help you avoid debilitating kidney disease later in life. The kidneys have a lot of important jobs in the body. They remove waste and extra fluid from the body, make an active form of vitamin D to support bone health, regulate the production of red blood cells, control pH levels, and release hormones that regulate blood pressure. The label chronic kidney disease includes any condition that damages the kidneys and decreases their ability to perform these tasks. These reliable sources provide additional information on diet and lifestyle patterns that support good kidney health. “Most of the people I see with kidney disease have a history of uncontrolled diabetes or high blood pressure,” says Kristen F. Gradney, MHA, RDN, LDN, a spokesperson for the Academy of Nutrition and Dietetics who works with kidney disease patients. “Getting those chronic diseases under control is an important step to avoiding kidney problems.” And, since obesity is linked to both diabetes and high blood pressure, excess body weight can be considered the number one preventable risk factor for developing kidney disease. Since these major CKD risk factors are all greatly influenced by dietary choices, researchers have begun to take a closer look at diet as a means of preventing kidney disease. “While in the past research was focused on how best to treat CKD, in recent years there has been greater interest in preventing CKD in the first place, and in the role that diet and dietary pattern can play,” says Deidra C. Crews, MD, ScM, FASN, FACP, Associate Professor of Medicine, Division of Nephrology at Johns Hopkins University School of Medicine. DASH to Fight CKD. The Dietary Approaches to Stop Hypertension diet (DASH) was originally developed to lower high blood pressure. Recent research has shown that people who eat a DASH-style diet are less likely to develop kidney disease. DASH limits sodium to 1,500-2,300 milligrams a day; emphasizes vegetables, fruits and whole grains; includes fat-free or low-fat dairy products, fish, poultry, beans, nuts and vegetable oils; and limits saturated fats, sugar-sweetened beverages and sweets. Mediterranean-Style Eating. A diet pattern based on foods common to the Mediterranean region, like vegetables, fruits, whole grains, nuts and seeds, seafood and extra virgin olive oil, has been associated with lower blood pressure, improved lipid profile, and decreased inflammation—all of which are good for kidney health. Lowering Acid Load. The kidneys are responsible for maintaining acid-base balance in the body. Too much acid in the blood makes the kidneys work harder, potentially wearing them out over time. While it seems logical that eating acidic foods would increase the acid load on the kidneys, the pH of a food actually has nothing to do with whether it makes your blood more acidic. For example, once they are digested, acidic citrus fruits like oranges and lemons actually decrease acid load in the bloodstream. In fact, plant foods tend to lower acid load, while animal proteins like meats and cheeses raise acid load. Both the DASH and Mediterranean dietary patterns have a lower dietary acid load then the traditional Western diet, which may be one of the reasons why they are associated with lower risk of CKD. Tags blood pressure, bone, bone health, chronic kidney disease, dairy, dash diet, diabetes, diabetes high blood pressure, diet, dietary approaches to stop hypertension, food, health, health topics, healthy eating, high blood pressure, high blood pressure and, hypertension, hypertension diet, inflammation, lipid profile, low fat dairy, lower blood pressure, mediterranean diet, nutrition, nuts, obesity, stop hypertension, sugar, to lower high blood pressure, uncontrolled diabetes, vegetables, vitamin, vitamin d, western diet, whole grains.